In this part of the series, we will discuss on a very important aspect – security and anti-spam on WordPress. With the increasing popularity of WordPress sites, the hacking and spamming attacks are also increasing. Tough the core of WordPress is quite secured, still it is not a wise decision to leave the security of your site in the hands of fate. In this part of the series, we will start discussion on the most essential security and anti-spam plugins to keep your blog safe from the hackers, spammer and bad bots and give more time and focus on improving the quality of your blog. These are the most essential security and anti-spam plugins which can protect almost every corner of your blog from the ever increasing hacking and spamming attempts. 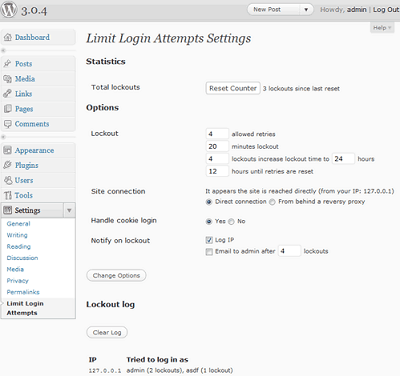 One of the most popular (around 2 million downloads), easy-to-use and effective security plugin for WordPress. A simple, user-friendly yet feature-packed WordPress security plugin that can take care of the entire security of your site. It is a very popular and must-have WordPress anti-spam plugin which can check all your incoming comments and trackbacks and filter the spammy ones for you. This plugin lets you implement a much secured yet easily human-understandable (simple match logic) captcha into your web forms in just a few clicks. It is yet another popular WordPress security plugin, which lets you scan your entire WordPress installation for vulnerabilities and malwares and automatically fixes them. It also includes a strong firewall too. Another WordPress security plugin, which can take care of most of the known security loopholes in WordPress with ease, but for me it turned out to be a bit weird and complex. An advanced level WordPress security plugin mainly for the experienced WordPress users as using the plugin is a bit difficult and complex. Secure your admin area by creating a stealth login page and block all the bad bots login attempts in a few click. Stop all brute force login attempts, by blocking an IP address when it has reached the limit for the number of login retries. This plugin does an intelligent job by adding a simple client-side generated checkbox which is always less painful than filling captchas. And as it is client-side generated, it is virually uncrackable. We are not done with our discussion on the security and anti-spam plugins in WordPress. WordPress security is a very important and vast aspect and needs more attention and discussion. So, in the next part of the series we will continue with more essential security and anti-spam plugins. This entry was posted in WordPress and tagged Anti-Spam Plugins, plugins, Security Plugins, wordpress on May 12, 2014 by Aritra Roy.